Late breaking news: unfortunately, due to complications arising from the severe weather in this area, we have to postpone this event. We’ll let you know when its rescheduled. Apologies for any inconvenience! 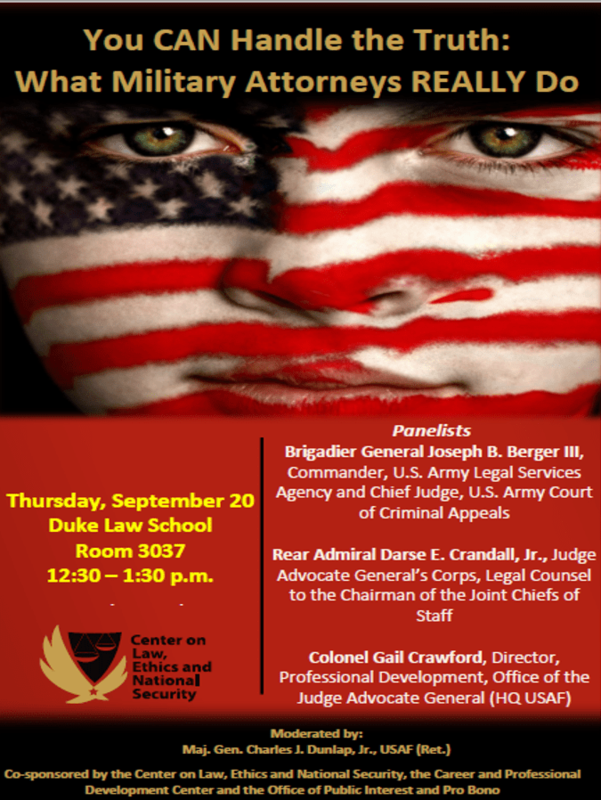 This coming week we’ll have a special, open-to-the-public lunchtime event at Duke Law which will feature senior military lawyers (called judge advocates or “JAGs”) from the Army, Navy, and Air Force. “You CAN handle the Truth: What Military Attorneys Really Do “is certainly relevant for those who want to consider being a military (or civilian) lawyer in the Department of Defense. This panel may also be of interest to anyone curious about the activities of the Pentagon’s 10,000 mostly-military lawyers who provide legal advice for a $630+ billion enterprise involving 3.2 million active and reserve military and civilian personnel. Almost every law practice and, for that matter, business endeavor is impacted by national/ international security issues in a significant way. 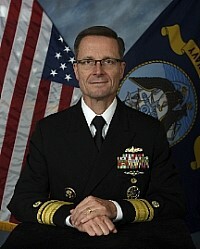 In my experience, most people are aware that military lawyers serve as trial attorneys in courts-martial and also advise on law of armed conflict issues, but not everyone knows that the practice of uniformed lawyers (called judge advocates or “JAG”) extends to contract law, environmental law, medical malpractice law, cyber law, labor law, administrative law, family law, international law, and much more. 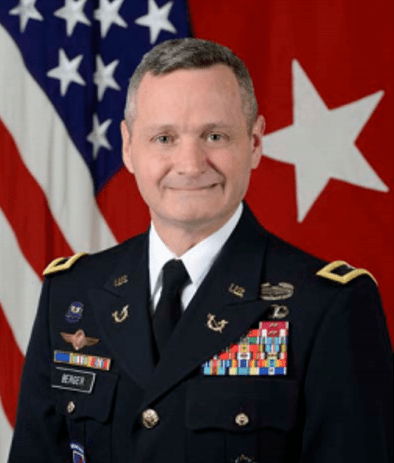 Brigadier General Joseph Berger will represent the Army, and Rear Admiral Darse E. Crandall, Jr., will represent the Navy/Marine Corps. Both are very experienced lawyers who can tell you a lot about their similar (but somewhat different) JAG Corps. I’m especially excited that the Air Force representative will be my good friend (and former Executive Officer! 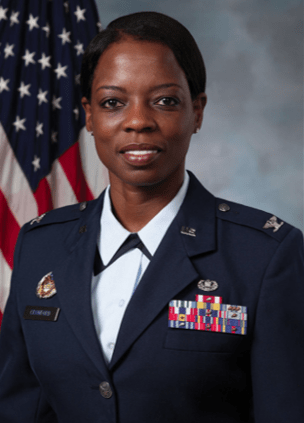 ), Colonel Gail Crawford who now serves as the Air Force JAG Corps’ Director of Professional Development. As I say, everyone is invited to this one-of-a-kind event. The panel will take place on Thursday, Sept 20th from 12:30-1:30 p.m. in Room 3037 of Duke Law School, 210 Science Drive, Durham, NC 27708. “Cyber, Security & Surveillance” conference videos online! Previous story What would the children have said?